What is a tillage radish? It is a carrot like plant with a gold tubular radish growing out of the ground. The green leaves are similar to turnips and are highly sought after by deer. The radish (gold cylinder) is eaten mainly by deer in late October through the winter. The tillage radish has been gaining popularity with farmers for the last 4 to 5 years. They use it as a cover crop, planting it at least 8 to 10 weeks before a hard freeze. This enables the plant to come close to maturity. There are several benefits to planting tillage radishes. The radish root system is very powerful and can penetrate the hard pan. The hard pan is caused by compacting the soil with equipment year after year. You typically only loosen up the top 4 inches of the soil with your normal farming practices. Below the 4 inches tends to compress so roots don’t penetrate and water doesn’t soak through very well. A healthy nightcrawler population will tunnel through that hard pan to help aerate the soil. The tunnels let water soak into the soil faster and decrease potential water erosion and drowning out of crops. The tillage radish has one or more large taproots that punch through the hard pan to a depth of 32 inches or more on the meat part of the root and another 6 feet in depth with the root hairs. This plant picked up the nickname Bio-Drill for this reason. Being an annual plant, the tillage radish will die from maturity, or freeze out eventually, every year. Many of the tubers are eaten up by deer, similar to turnips in the fall or winter. After the plant dies the roots decompose rapidly. Depending on snow cover, the frost will only go down to a foot or so. Below that level, the roots will decompose before spring. A normal wet spring with snow melt and rain will rot the rest of the old root system leaving holes in the hard pan. Now water can soak up with a lot less runoff. Your new crop the following year, no matter what it is, will root down to the perforated hard pan, fan out its roots, and some will travel down the holes for more moisture and nutrients. The tillage radish is a nutrient scavenger. Because its root system goes so deep, it can reach more nutrients. Most of the crops that we plant for food plots are shallow rooted like corn, soybeans, turnips, wheat, rye, and clovers, for example. A percentage of our expensive fertilizers seep down and into the hard pan when it is soft from excessive rain and spring thawing. The tillage radish pulls these nutrients back up to where our crops can reach it. These nutrients include nitrogen, potassium and potash. Also they bring up trace minerals like boron, chlorine, copper, iron, magnesium and more. These nutrients and trace minerals are stored in the tuber. This is why the crop is so good and sought after by the deer. It is like having live mineral blocks. Any plant matter left behind is full of nutrients left right on the surface for our new crop the next year. You will notice a thin white layer of calcium on the decaying plants in the spring. The tillage radish grows great with winter wheat and rye. It also makes up approximately 10% of all my turnip mixes. It grows well in many soil types, but struggles with wet, soggy soil with poor drainage. The plant germinates in about 3 days. It will grow very fast. If you fertilize it with nitrogen, it will grow even faster and get huge leaves and a massive root system. After the last spraying for the year on your Round-up ready crops, you can broadcast radish seeds onto the corn edges and bare spots. 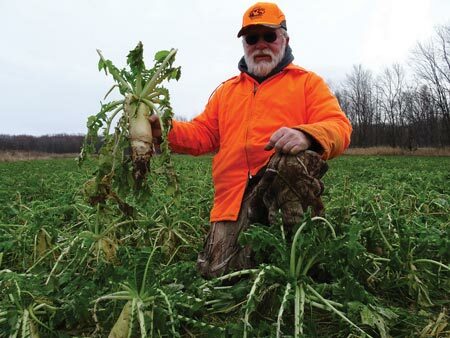 If your soybeans have been beat up by grazing deer, you can broadcast a turnip mix with 10% radishes over the top. The first rain will set the seeds into the top muck layer and away they grow! The tillage radish seeds are getting easier to get because of the farmers using them as a cover crop. My favorite source is Midwestern Bio-Ag out of Black Creek, Wisconsin. My contact there for seeds and fertilizer is Sierra Kalbus at 715-250-1837. I’m always seeking out different or “new to me” crops to see how the deer and other animals react. This is my third year experimenting with the tillage radish. It is a green and gold Super Bowl contender in my food plots. Go Pack, go!